To toll or not to toll, that is the question. So far, the answer has been no, but the question of charging a toll on vehicles entering the Florida Keys will come back before the Monroe County Commission when it meets Wednesday in Key West. The county now charges a $1 toll on Card Sound Road, but U.S. 1, the primary artery connecting the Keys to the mainland, is a free ride. County Commissioner Heather Carruthers, who has been unsuccessful in lobbying her fellow commissioners on the toll idea, is concerned the Keys will not be able to raise enough money to pay for state-mandated sewer projects through property taxes alone. She also said it is not fair to have residents pick up the full tab for wastewater systems, as millions of tourists use those services too. Carruthers has called for a discussion about placing a tollgate on U.S. 1 at the entrance to Monroe County, and to give county staff direction to further research the proposal. The state Legislature has given the Keys until December 2015 to upgrade wastewater treatment throughout the county. The Legislature this year reauthorized a bond that could bring $200 million to the Keys for wastewater projects, but the money has yet to be allocated. With the state struggling to balance its own budget, there is concern that it could be years before that money reaches the Keys. Legislators recently balked at a plan to allow the county to add an additional cent to its sales tax for wastewater projects. Without state support, additional sales tax or toll revenue, some Keys homeowners face as much as $20,000 in sewer connection fees. "We can't rely on just ad valorem taxes," Carruthers said Monday. "The state won't consider a one-cent sales tax, and we have to pursue other options." The Key Largo Chamber of Commerce has opposed a toll on U.S. 1, fearing it would reduce the number of visitors to the Upper Keys and would be unfair to commuters who live in Florida City and Homestead. Earlier this year, the chamber posted a poll on its website asking people whether they supported a toll. Of the 209 people who responded, 70 percent opposed the idea, according to the chamber. "The chamber appreciates Commissioner Carruthers' willingness to explore all possible revenue options in these days of decreasing property taxes," said chamber President Jackie Harder. "We still have questions that would have to be resolved before we could support it -- particularly on how such a toll would impact local businesses and their employees, many of whom commute daily from the mainland." Carruthers said SunPass and other technology has made paying tolls more convenient, and keeps people from having to stop. 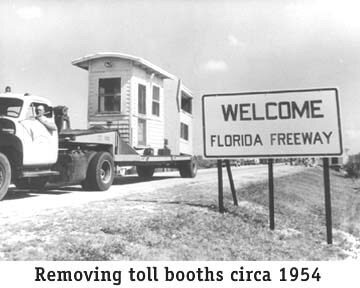 Tollbooths were placed on Big Pine and Lower Matecumbe keys in 1938 to pay for road and bridge work after the 1935 Labor Day hurricane. They were removed in the 1950s once the bond was repaid, according to Keys historian Tom Hambright. Back in the real estate boom in the Florida Keys, open water homes were priced well above $1,000,000. In today's market, however, there are several homes to choose from priced at $1,000,000 or less. There are 152 homes in the Florida Keys being marketed as open water. They range in price from $159,000 (a small mobile home in Key Largo) to $1,000,000. The average list price is $719,824. Click here to view the listings. * Please note, that some of the listings may have been entered as single family when they are in fact, mobile homes. Also, one or two listings on large open canals have been marked as open water when they are actually canal-front homes. You can tell properties that are true open water by looking at the photos and the maps. 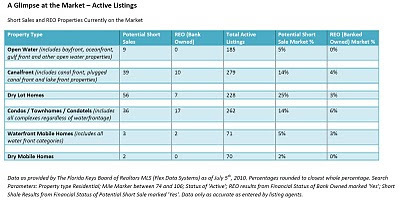 Distressed Listings - What percentage of the market do they represent? It's no secret that there are several potential short sale listings and bank foreclosures being offered in the Florida Keys real estate market. Different property categories show different percentages of distressed properties. For instance, of the 185 open water homes currently listed in the Upper Keys, just 9 of them are being marketed as potential short sales and none of them as being marketed as bank owned, giving distressed properties in that category just 5% of the overall market. 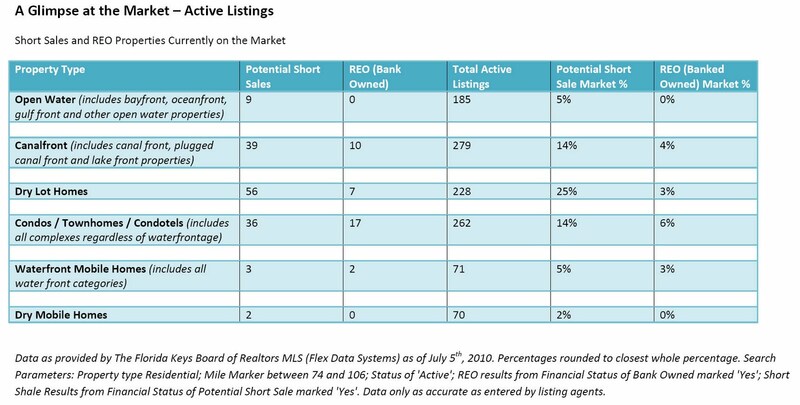 Dry lot homes on the other hand show dramatically different numbers: of the 228 dry lot homes on the market, 56 of them are potential short sales and 7 of them are bank owned, giving distressed properties in that category 28% of the market. It's important to note that not all properties being marketed as potential short sales actually are short sales. Sellers and their agents often choose to market them as short sales when in fact it is not known if the seller's lender would even approve the short sale process for the property. When considering purchasing a listing marketed as a short sale, it is important to determine if the current lender has approved the seller and the property for the short sale process. Be sure to ask the Realtor working with the seller if the hardship package has been submitted to his or her lender. If it has not been submitted and/or approved, the sale of that listing could be delayed several months, or even denied, costing a buyer time and added aggravation during the home buyer process. 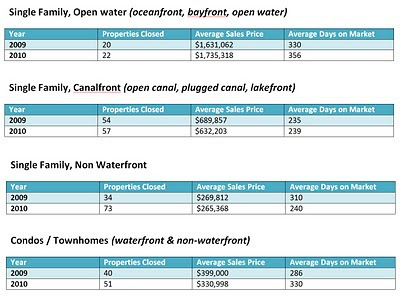 These numbers are for properties located in the Upper Florida Keys, which includes the areas of Key Largo, Tavernier and Islamorada. The reason for the increase in the number of dry lot homes sales is most likely tied to their decline in price and an abundance of inventory. 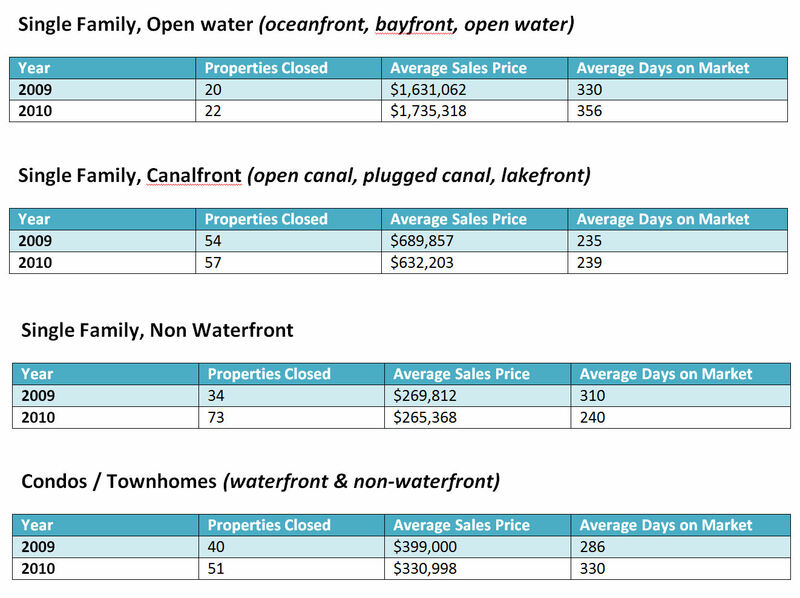 All data is provided by the Florida Keys Multiple Listing Service - FlexMLS, as of July 5th, 2010. Properties are from mile marker 74 to mile marker 106, Upper Keys only. 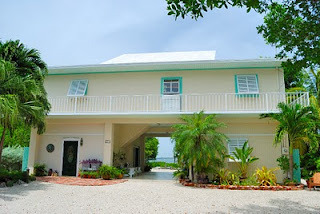 Curious to see what's selling in the Florida Keys? We've put together a list of properties that are currently pending in Upper Florida Keys by category. These links are live and automatically update as properties go into pending status.